A WDBJ live report appears to have ended in gunshots after a gunman apparently began firing at the news crew early Wednesday morning. WDBJ reporter Alison Parker was interviewing a woman at Bridgewater Plaza, a shopping center in Roanoke, VA, when the apparent gunman strode into the shot, firing what sounded like at least six shots. 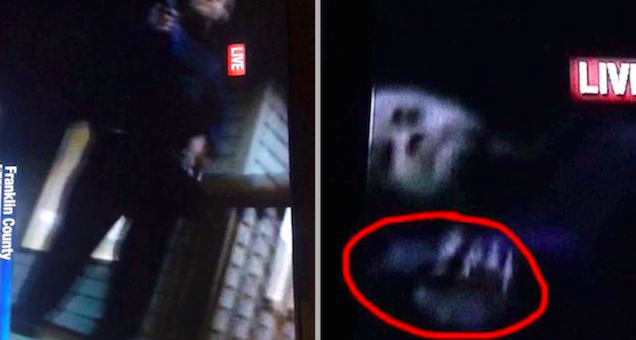 The alleged gunman can be seen, briefly, in the shot before the camera drops. WDBJ has confirmed that police are currently on the scene, investigating what they’re calling an “incident” involving their news crew. According to WSLS10, there were at least three victims but the extent of their injuries is currently unknown. Schools in the area are reportedly on lockdown and both directions of Virginia 122 have been closed while officers from Bedford, Franklin County, Virginia State Police and the Virginia Dept. of Game and Inland Fisheries search for the alleged shooter. 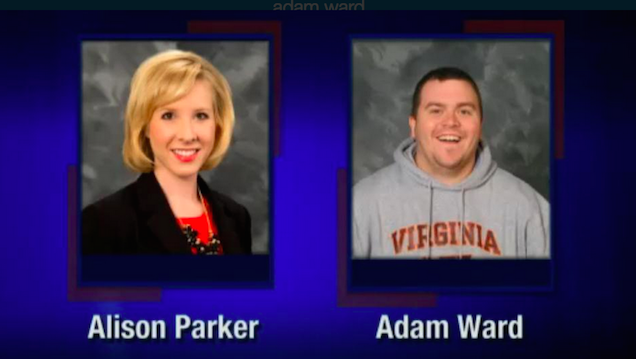 WDBJ says reporter Alison Parker, 24, and cameraman Adam Ward, 27, were both killed in the attack. According to CNN’s Brian Stelter, Ward was engaged to a morning producer with whom he planned to move to Charlotte. They were planning to celebrate her last day at the station with a party this afternoon. Watching @brianstelter on CNN - says camera guy engaged to morning producer and today was her last day, there was a party at the station. CNN reports she was in the control room and saw the shooting happen live. CNN reports that contrary to earlier reports, the woman being interviewed—Vicki Gardner, executive director of the Smith Mountain Lake Chamber of Commerce—was also injured in the shooting. She was reportedly shot in the back and is currently in surgery. The gunman is still at large. Parker was also engaged to be married—to Chris Hurst, an anchor at the station. The ATF has joined the manhunt and Jeffrey A. Marks, president and general manager of WDBJ, says officers believe they know the man’s name and license plate number. Virginia governor Terry McAuliffe tells WTOP the shooter may have been a “disgruntled” former employee at the station. The suspect has been identified as Vester Lee Flanagan, a former employee of the station, who also went by the name Bryce Williams. Two videos of the shooting were posted to a Twitter account associated with Williams/Flanagan—an account which has since been suspended. The same footage, this time in one video, was also posted to a since-suspended Facebook account under Williams’ name. Update 11:56 am: Williams/Flanagan has reportedly killed himself. Update 12:24: Williams is reportedly still alive and in critical condition after shooting himself.